This picture kind of makes me laugh. I forgot to mention that on Friday, Harper had her last RSV shot of the year. She did pretty good. She weighed 12 lbs and 11 oz. BIG GIRL! I heard through the grapevine today that our (cute and single) pediatrician is moving to Africa soon to be a medical missionary. Yeay for Jesus , sad for us. So I guess we'll be looking for a new one before too long. 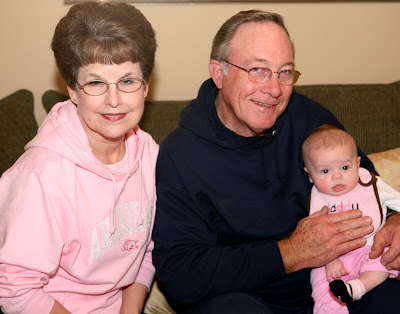 Harper enjoyed having her grandparents here. She gets spoiled when there are lots of hands wanting to hold her! You were all asking about the light panel. Here it is - Scott finished it today (ignore our mess of a garage). Scott got the instructions here. Once we get some backdrops and a set up - I'll post pictures of before and after to show you how it makes a difference. 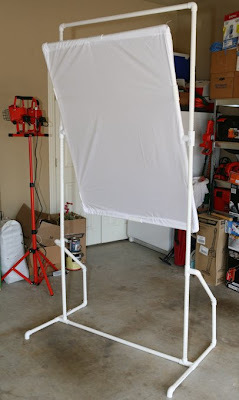 A blogger sent me a great link that talks about how to make neat backdrops from fabric. Here is the link. I may be experimenting this week- stay tuned! A lot of you have asked when we will start getting Harper out. We are going to try and make Easter Sunday our first family trip back to church (I can't wait) and then after that - we will probably start taking her out. She'll be 3 months at that point. We'll still be pretty cautious but I feel safer once sick season is past and with her RSV shot. I can't wait to be back around all of our friends!!!! And finally : keep this family in your prayers. They have a little girl who has been battling a brain tumor for a year and it does not look good. Can't wait to read more about the photography adventures!!! I love, LOVE David Crowder, and my favorite song is an oldie but goodie...and will always be my favorite...All That I Can Say. kelly! 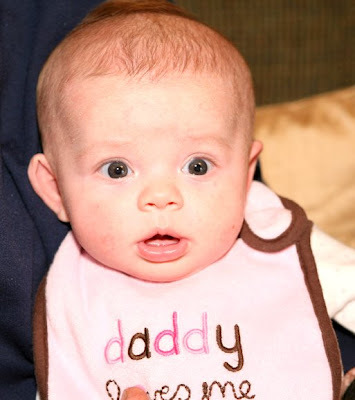 i started reading your blog on the day harper was born...before you knew she was even sick! i somehow wandered upon it and i've been hooked ever since! around that same time, i started going back to church for the first time in years. you are such an inspiration and harper is oh so cute! Kelly, I started reading your blog when your little Harper was in the hospital. I look forward to reading it everyday. The drummer from David Crowder, Jeremy Bush, he and I grew up in our youth group together. He is a wonderful guy and he used to play the drums in our youth band. I wish I would have payed more attention to his drumming skills back then. I just wanted to tell you how very cute I think you and your family are! Harper looks like she loves having her grandparents around! That will be interesting to see the before and after shots with the new light panel. Very creative! Easter is right around the corner, I am already looking forward to seeing what Harper will be wearing for Easter Sunday! Oh, I can't wait to see what a great photographer you will become. Pretty soon, your friends will be coming over for appointments during the day to get shots done in your "studio"! Kelly, I'm so glad Harper is doing well! Too bad the nice single doctor is moving to africa, but i'm sure africa will be blessed by him. My fave DCB song is "Here is our King"
Wow, can't wait to see the difference it will make! P.S. I saw the shoes on your blog the other day, and ran right to the website to order Clara a pair! I'll probably put them in her Easter basket! Harper looks great. So glad that you will be able to go out on Easter as a family. Kelly, I am SO glad y'all have been so cautious with Harper because my cousin got RSV when she was a newborn from the church nursery and almost died. I want to scream when I see people who have their newborns in walmart and the mall when it is freezing outside! Kelly - I can't wait to get my hands on the new David Crowder Band either! Love the pictures of Harper. Praise God she is doing so well and growing! Your love for the Lord is apparent and I thank you for being a "light" to me as a Christian young woman. The album "Church Music" sounds like it might be like Bart Millard's "Hymned Again". Have you heard it? He's the lead singer for Mercy Me. I wrote about it last month in a post. http://abbysugarandspice.blogspot.com/2009/03/visit-wtih-fam.html. I love your photography. Harper is just so cute! I can't wait to see your at-home studio! Can't wait to see what the back drop does! So glad Harper is doing so well! that's so neat. i can't wait to see the difference it makes in your pictures. you sure learn a lot about photography when you have kids, don't you? I am excited to get this information about the light panel. I will have to share this with our Video Technology teachers in my school district. You know how schools are always on a budget! This looks affordable. Easter Sunday was D's first time in church, too! I LOVE David Crowder and it's too hard to pick one song that's my favorite! Easter Sunday 2006 was Addies first time in church too! Its really special! I LOVE that pic of her at the top of the post!!! She has the prettiest eyes! Hi Kelly! I'm one of your many faithful readers! (From Nashville, Tn!) I began reading your blog right after Harper was born. Oooh! Thank you so much for the backdrop link! I'm going to try that for sure!! I will definitely be picking up David Crowder's next album! :) Harper looks adorable, as always! Kelly The 1st photo of Miss. Harper is so cute . . . . But , Once again . . . I tell yours & Scott's Daughter , Little Miss. Harper Brown Stamps , Looks exactly like a baby Photo of Me when I was a baby. Althought I was away skinier at birth than Little Miss. Harper was. Since I was born with Spina Bifida. I love that screen, what a clever thing! I haven't heard DCB before, I shall go and seek him out! Thank you for sharing about baby Emily. Breaks my heart. I will be praying. My three year old son absolutely loves David Crowder and his favorite is "You Make Everything Glorious". He knows all the words and requests it in the car! (we love "Never Let Go," too) We live in Waco (TX), where David Crowder's church is, and one day my husband took my son to the zoo and they saw David just walking around there and Hudson was so excited meeting him- it was better than Elmo to my boy! Wow, I am pretty impressed that your hubby would do that for y'all! I bet you will get some great pics. Thanks for mentioning these families that we can pray for! Very excited to hear the news about DC's new album!! I'm usually a lurker, but wanted to suggest marine vinyl for a backdrop! You can get it at JoAnn Fabrics for 12.99 a yard, and if you sign up for the e-mail list, you get 50% off coupons all the time! Also, www.ilovephotography.com is an AMAZING resource for children's photography!! I am so impressed too with the back drop and I cannot wait to see the difference in pictures! BTW - We go to Bentonville Peds too and we use Cadle and I LOVE HER!! She has been great with Claire and Owen and I think you would love her. She has many patients and sometimes does not take new, but I think you could get in if needed. Just thought I would let you know =). "Little Miss" is cuter and cuter every day. And getting big! I'm anxious to see how your light panel works. Everything Glorious has really blessed me in the past year because I finally realized that applies to me. He is doing a new work in me and those words were such a blessing. Just saw DCB in concert (for the second time in 6 months) in February! I love David Crowder and my fav song is All That I can Say...means so much to me...gives me goose bumps just thinking of the words! And I'm especially spoiled because I live in Waco, which is where David Crowder's home church is, so I can here them everytime they are in town...which has been a lot lately! Kelly, I am also from NWA and go to Bentonville Peds. Our daughter Stella is 21 months old and we love Dr. Foster but we also think that Dr. Cadle is wonderful. Texas all the way baby! I don't know if you remember I'm from Texarkana too. Can you believe I watched David Crowder in a youth band when I was in youth group at church?!?!? I still can't believe he's made it so big! LOVE his music! Don't know about favorite, but we sang The Remedy this morning in church - I love that one! Glad Harper is doing so well, I don't comment often, but I love looking at your pictures and I still pray for you guys. Can't wait to see all the new photo shoots with the new backdrop! Easter Sun will be the first Sun we take our new baby to church too! She is already 13lbs!! We call her a chunky monkey too! I love DCB. Our God Reins is my favorite. Harper looks cuter than ever! That first picture is too cute. Funny girl! I am so impressed with the light panel I cannot even tell you. Can't wait to see the pictures of your lovely and adorable subject. I'm interested to hear how the panel works out! Too ironic, our first trip as a family after Z-man was released from solitary because of RSV was Easter Sunday, 3 years ago. What a great time to make her entrance! Have lurked for a while, but I just had to comment on your DCB question. I adore "Everything Glorious" and could listen over and over again. Harper is insanely gorgeous and I love checking in to see her daily outfits. Miss Harper is just a doll baby!! Kelly, What kind of camera do you shoot with? I have a canon 40D and are still trying to learn all of the bells and whistles, but love the idea of the light panel. I never would have thought of that. I also love your blog and check it out daily just to see what cute things Harper is doing. I am so sorry to hear about your pediatrician. I know it is so hard to find a good one. We are also from NWA, and we have used Rainbow Pediatrics for 4 years. We absolutely love them, mostly because they give my children lots of one on one time. I highly recommend them to everyone. Marilou is a nurse practitioner at the clinic and she is the best around!!! Good luck in your search, and keep up the great blogging. So can I schedule Brody an appt at your home studio??Haha! You are super mom! Sad day about your pedi. Go God! But seriously, so sad. Ha! Everything Glorious is my favorite DC song, but really I love them all! Great worship music!!! Can't wait to see the pics with the light screen. I love to take pics, I have a Canon as well. Awesome panel! I am a. Texarkana TEXAS girl :) knew the Crowders from church and Brookhill. Love his music. Hey Kelly! Jsut wanted to let you know that I am still reading when I get the chance! Things have just been pretyy hectic fo rus and I haven't blogged in almost two months :( but I am checking in every few days to get my Harper fix :) Who knows...I may even get energetic and post soon! :) Love to you all...kiss that baby girl for me! I am coming to see her one of these days! J LOVES the video of her...she asks me to pull it up everytime we come in the computer room! :) So glad your getting to be a stay at home mommy!!! Yay!!!! I love that light panel...can't wait to see the results! This is sad that I am posting for the first time on this topic, but I was wondering if the good doctor was single. Darn. At least he is being obedient to a calling; you can't argue with God! Harper is so beautiful! You and Scott are so incredibly blessed! Ya'll should make a trip on down to Waco and attend University Baptist Church where he leads worship sometime - it would be fun to see ya'll! I see Harper is wearing the botties/socks in the picture that proud grandpa is holding her. Where can I find some? They are precious!!! This is such a special hymn. Wanted to share it today. Praying! "Rock of Ages, Cleft for Me"
Can't wait to see Harper in her Easter dress. I like Only You by David Crowder. Thinking of you as you find a new pediatrician. What an incredible calling your talented doctor has! I know you must be sad but so proud. I love that picture of Harper!! I didn't know DC was from Texarkana?! That's where hubby is from, where I went to college, etc. I'll have to look him up more! I love DC! Miss Harper looks cute as ever. What camera do you use for shots of your little sweetie pie? "Glorious" by DCB is my all time fave! "what does that make me?" :) Keep us posted on the photography adventures!!! Love the neat photography stuff you are working on! I LOVE David Crowder, too. I live near Waco and I usually drive by his house a few times a week. (not stalking...lol, it's just on the road that I drive..haha) They remodeled an older home in downtown and it is beautiful! I can't wait to hear the new album. Love Love Love David Crowder. My husband I are kind obsessed. Anyway, I can't pick just one favorite. A few of my favorites are Wholly Yours, Only You, Everything Glorious and to rock out to...Here is Our King. Hi Kelly!! Do you know where in Africa your pediatrician is moving? I have several friends who are living in Africa as medical missionaries. I know it can be a difficult transition and it helps to have a support team. Maybe we can put them in contact?? Let me know!! My favorite singer is Jeremy Camp! But my favorite DCB song is Open Skies, I love how springy it sounds. I like listening to it loud with all the windows down! Harper's growing so fast, she's adorable! I'm anxious to see how the back drop makes a difference. I think "wholly yours" is my fav, but it is hard to choose! Harper gets cuter every single day!!! :) I am excited to see her "Easter dress/debut out at church dress!!" ok, and the kiddos needing prayer...u got it! we didn't take sofia out at all until it was past rsv and flu season...preemies can't handle that! anyway, she's finally 15 months and will hit the church nursery for the first time in 2 weeks! wooo hooo. Hard to pick a fav dc*b song. "Never Let Go" is a newer favorite. So encouraging. My daughter is best friends with the newest dc*b guitar player, Mark Waldrop. They met as freshmen at Baylor in 2005. He joined the band in 2007. Left a 4.0gpa to be a rockstar! Plus she goes to dc*b church & is childrens church leader. She is already sad about graduating in 7 weeks and leaving Waco. I know God will open the right door for her. I have followed your "adventure" with Harper since the 2nd or 3rd day. I LOVE the pics. God puts people in our lives for a reason. Blogging has brought me the world outside my usual scope of vision. It's an amazing ride. Harper is getting so big and gorgeous, i am excited for you to get her out to meet everyone! So fun. Such a sweet baby. I wrote about your blog today. Kelly--Yes, I too love DCB. You should have Rebekah and Cilla go over to his house in Waco and take a picture outside of it--people do it all the time. Their was a feature story in the Wacoan about his charming, cool house and studio--but I couldn't find it online. Anyway--just thoguht I'd throw that out there. Jackson loves DCB. It makes me so proud. I was listening to "stars" earlier. It's a good one. My fave David Crowder band song is All I can Say. I love love it...I still listen to it over and over! It's gonna be so nice to be able to take little Harper to church and to Wal-Mart, of course!!! My daughter Laiken was sick as a baby so we took loong rides in the car alot! I love all of David crowder. I went to Baylor and went to his church, was always fun when they were there. Harper is a doll and one lucky little girl! I LOVE DCB! We went to a concert a little over a year ago and actually got meet & greet passes. I have a picture of all of us with him. It was cool. My favorite song has become Everything Glorious. WE used that song to make a picture/video slide show for my sons dedication. He makes everything glorious- especially my baby!! I just discovered your blog and wanted to tell you that I think you have such a beautiful family! Harper is adorable! My hubby & I tried for 15 years to have a baby. I pray the Lord blesses your family in a very special way! love David Crowder, who doesn't? My favorite song is Wholly Yours for sure. I love everything DCB. Whoohoo, can't wait for the new album. Thanks for the tips on backdrops, I'll have to try those, too. looking forward to seeing more pictures of your beautiful baby girl!! she is such a cutie. i can not believe all those clothes in her closet!! lol. I LOVE "Here is our King"!!! I always want to dance in the isle at church when the worship band plays it! This will be my first comment on your blog, i do love reading it and feel very connected to some of your comments. We too triumphed over infertility, and are truly blessed to have welcomed a son and daughter into our home, hearts and lives thru open local adoption. I still cry when i think of the wonderful gift and sacrifice our children's Birthparents made to help us to be a family. Enough about us - i have a suggestion for your next photo shot. A friend uses her Bumbo to sit her infant daughter in for photos. If she is taking a photo which show's below the waist, she places a complimentary blanket on the bumbo first, the put baby in. I did this as well for our DD, and found her photos to be so much more engaging, and she did not have that slumped over look. the Bonus being all of her lovely outfit could be seen as well. Good luck with your next photo shot.